I first visited L.A. when I was nine years old. Michael Jackson had just died; think flowers on his star, flowers outside his house in Beverly Hills, and grieving for the fantastic singer everywhere we went. It was an interesting time to visit. 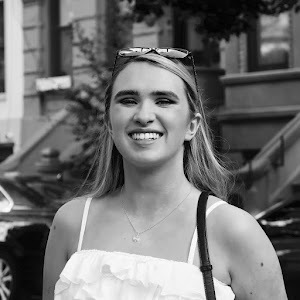 Since then, especially now in my teenage years and with my growing interest in films and all things art, I was keen on returning to the city. The movie La La Land, when I watched it for the first time back in January, was one of the main reasons why I wanted to visit L.A. again. So, I convinced my parents to bring us back to Hollywood for our America trip as I quickly became a La La Land fanatic, the girl who knows the whole soundtrack, even instrumentals, like the back of her hand. I felt the last time I visited I was only in love with the America Girl shop, so this time, I was to appreciate the land of film like the real entertainment-junkie I am. We stayed in the Redbury on Vine Street ( yes, Vine Street), and our first full day was jam packed with a fun Warner Bros. Tour, visiting La La Land sets and finding the most Instagrammable spots of L.A... oh yes, I went that far. I loved the Warner Bros. tour. It was so cool to see famous costumes, props and sets from Batman and Fantastic Beasts but the tour guide did not add to it. He was that bit too cheesy and annoying, but at least he was fun. 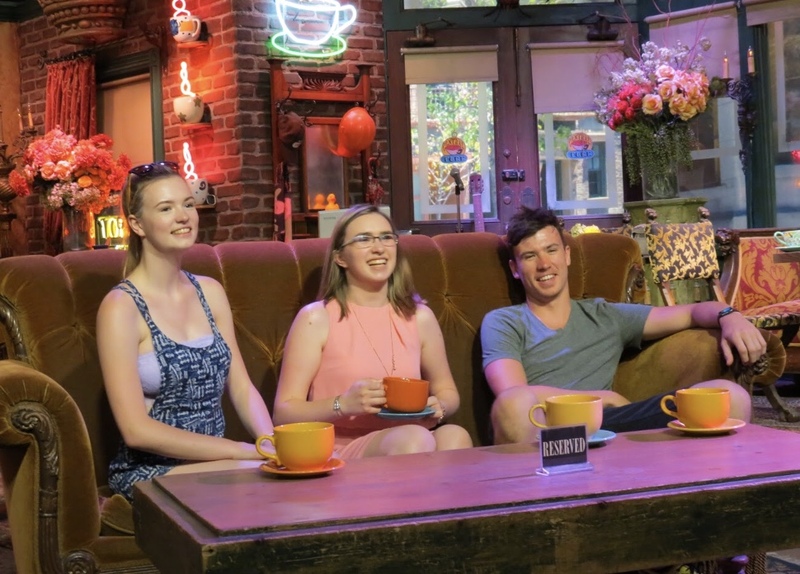 My brother, sister and I had a quick cuppa in Central Perk, as you do. I got to live the Hogwarts dream and ride a broomstick, waving around a wand (check out the video above for footage). Expelliarmus! Warner Bros. is the company behind so many iconic TV shows like Friends, Gilmore Girls and Pretty Little Liars and films including Casablanca, which I still have to see, DC movies and Gravity. I got to see costumes, props and sets from all of those amazing shows and films, but a huge highlight for us was seeing the Big Bang Theory set. Unfortunately, we were not allowed to take pictures of anything. Leonard and Sheldon's apartment, Penny's apartment and the little hall in between with the broken elevator looked even cooler in real life, but smaller. That is because of 'forced perspective', according to the tour guide, as the cameras make the rooms look bigger. If you follow my Instagram, you'll know the highlight of the tour was seeing the café Mia Dolan works in from La La Land. Technically, it's a Lionsgate film, yet the set was still there as the Golden Globe and Oscar winning film filmed a lot of scenes in Warner Bros. Studios. I was pretty much trying to keep myself together when I got off the tour bus to run around and admire the yellow umbrellas and mint coloured building. Emma Stone and Ryan Gosling walked where I walked. Woah. If you thought I was finito with La La Land talk, you're oh so wrong. After the tour we bopped over to see the Hollywood sign (scroll up to see those photos), and the Griffith Observatory. It was closed that day, so I couldn't waltz my way around inside trying to re-enact the film, yet I still got the chance to pose for some pictures (for my next visit, I will go inside, I will). If you want some cool murals to strut your stuff in front of, Melrose Avenue is the place to go. It has some really cool shops there too, and I'm pretty sure we passed the filming of an ad or something - well, that's Hollywood! I loved the colourful wings, and the rainbow wall was pretty snazzy. It's at the side of Paul Smith, where the wall is usually pink but was multi-coloured for Pride month, I presume (I got little pink at the side of the building, woooh!). I'd say the Made in L.A. pictures would have looked cooler if the sun decided to stay up in the sky a little longer. That night we browsed the Hollywood Walk of Fame by Grauman's Chinese Theatre, posing with some stars and me fitting my hands into Jennifer Lawrence's. We have the same hands!!! 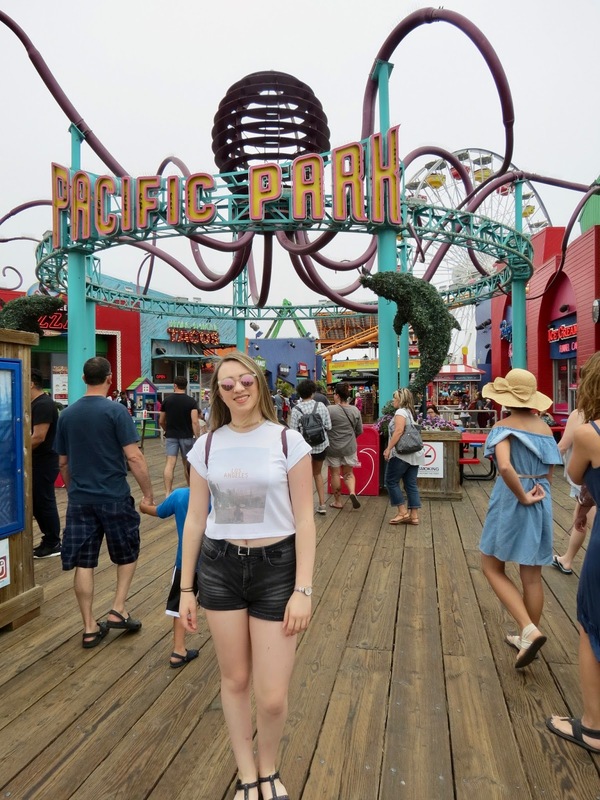 The next day, we went shopping in The Grove (some cute buys in Brandy Melville <3) before Dad drove us to Santa Monica. 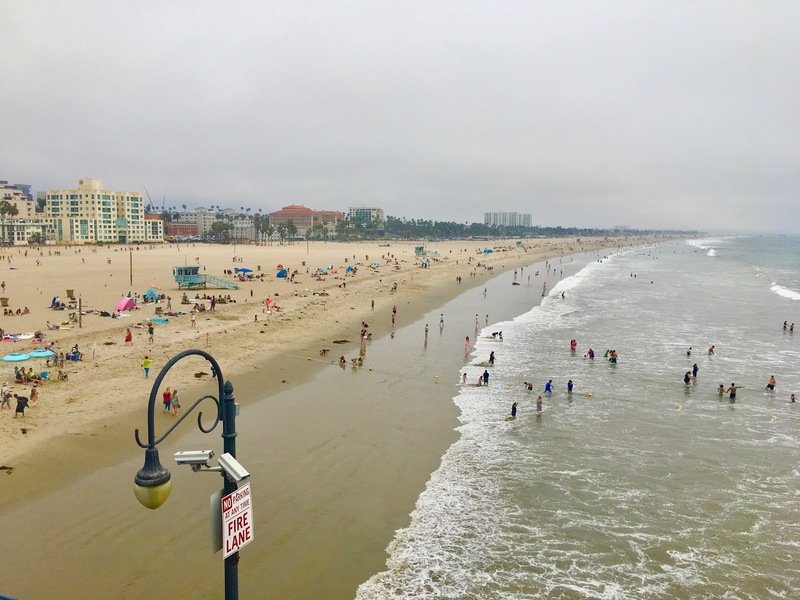 There were clouds in Santa Monica when we arrived. Clouds! How dare you, Los Angeles. We walked up the beach, then up the pier and my sister and I decided to try out a rollercoaster. We went front row, which was so worth it, and it was pretty good since we went around twice. We had a view of the whole pier from up high and got a thrill out of the ride. We went for lunch in a place we'd been before, Shutters, and I ate the nicest brownie and ice cream dish ever. The sun finally came out, so we got our swimming gear on and went for a dip in the Pacific. It was surprisingly cold, but refreshing. The Book of Mormon - a fantastic, hilarious musical. I'm big into musicals, and this famous one about Christian Mormons was on my to-watch list for ages. I sported my sister's stunning pink/coral dress to the famous Pantages Theatre near our hotel. The Broadway musical was surprisingly inappropriate and rude, but so much fun, and the songs and dance numbers were spectacular. 'Turn it Off' was the highlight! L.A. was a brilliant stop on our American trip. Quick, but busy. Next, and finally, was Las Vegas; I am not going to do a blogpost on Las Vegas, but you can go to my channel and watch my Vegas Travel Diary here. The O Show, relaxing by the pool and Queen + Adam Lambert were the best parts of those few days there, and that's pretty much it for #QOQinUSA!